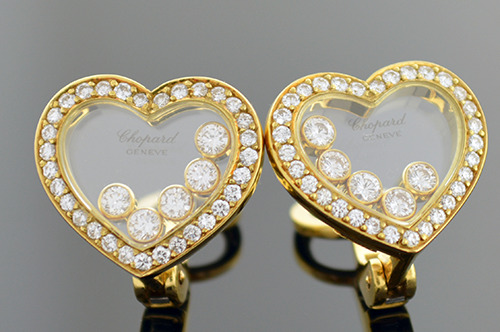 Happy diamonds are one of Chopard's most well known collections. This pair of non pierced earrings holds 10 diamonds that float and cascade between two pieces of sapphire crystal. Sapphire crystal is highly scratch resistant to ensure your earrings will be as beautiful in ten years as they do today. This pair of clip-on earrings made of 18 karat yellow gold hold 10 bezel set, round brilliant cut diamonds that have a weight of approximately 0.50 carat total weight and 62 round brilliant cut diamonds that have a weight of approximately 0.50 carat total weight. These diamonds weighing approximately 1.00 carats total weight have an average color grade of F-G and an average clarity grade of VS(1-2).